This book made me look at life here, on earth, in the view of a man in heaven. In the perspective of a man who had an unfortunate childhood. It’s sad. Then it made me sad. But it just proves the old cliché, saying that everything happens for a reason. That there are no random events. We all make sacrifices and it’s not something to regret. Forgiveness is the ‘something’ that we need to live freely. And a lost love is still love; life has to end, love doesn’t. And life has a purpose. I’ve always thought of heaven as a place with grassy lands and beautiful falls, rivers and such, where you see your other dead relatives. A place with angels playing harps and others are offering fruits. It’s always a sunny day and there’s this light, a big shiny light where you can talk to because it’s God. This book changed my view, now it is a place where I make sense of my yesteryear. Now I’m wondering who will be my five people. 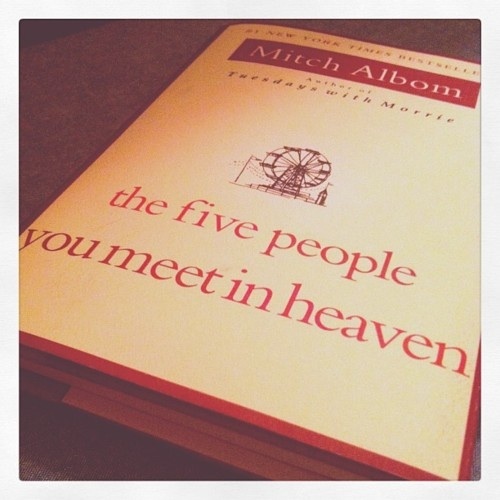 By reading this book, I died then when I did, I lived. I lived a life where I made mistakes and regret them. Little did I know that made my life worth it. The mistakes I made are the things that made my life just the way it is. And that I can never ask for ‘another’ life, for a better one. This is second in the list of my favorite books, behind “Para kay B”. They said that “If you don’t like reading, then you haven’t found the right book.” Check this one out, maybe it’s yours.